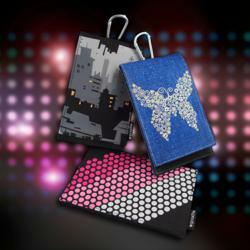 Eco-fashion is big and getting bigger and now you can wrap up your mobile phone in sustainable style too. Hailed as a 'better, smarter, greener choice' for the style conscious consumer - e-pouch have just launched their 2012 range of fashion foward, planet-friendly cell pouches. As the glamorous world of haute couture continues to embrace eco-friendly fashion with many of the industry’s big names creating breathtaking and exquisite designs, it’s finally time to put to rest the old image of eco-friendly clothing being badly fitting and uncomfortable to wear. Oscar Best Actress Meryl Streep wore Lanvin's first-ever eco-friendly gown and The Artist actress Missi Pyle wore a cruelty-free, mineral-dyed “peace”-silk gown by Valentino Delfino. Also getting the eco-fashion treatment are, of course, a host of shoe, handbag and jewellery labels and now, with its new 2012 range of eco-friendly pouches, you can wrap up your mobile in sustainable style too with an e-pouch. Created by UK design company Anokimobi, the e-pouch range of phone pouches and wallets not only look good in a mix of vibrant colours and striking prints but are constructed from 100% organic and recycled materials. Incorporating clever design features such as discreet pockets and easy access features to keep credit cards, coins and headphones safe too, the e-pouch range is promoted as a ‘better, smarter, greener choice’ for the consumer and doesn't come with an expensive 'green price tag'. Comprising fourteen core designs, the range is suitable for cell phones, cameras and MP3 players and is the only phone pouch range to contain Biomaster® anti-bacterial silver ions to reduce everyday germs; a potential health hazard that hit the headlines last year. Anokimobi started its life in 2002 designing and producing mobile phone accessories with a twist; offering clients bespoke wrist straps, phone charms, lanyards and pouches. Quickly gaining a reputation for innovation, within 6 months of trading Anokimobi was working with clients such as BBC, MTV, Burger King and Virgin Trains and later went on to design products for most of the telecoms and mobile phone companies including Nokia, O2, Orange and Vodaphone. As its reputation for design excellence grew, Anokimobi was increasingly commissioned to design and manufacture products outside of the mobile phone market and in 2007 it began actively promoting and pioneering a range of greener products for its retail and promotional clients. In 2011 it launched the e-pouch range of pouches and skins to offer a greener alternative to the mobile phone covers, cases, pouches and skins on the market. Like designers in the fashion industry who are increasingly designing beautiful, planet-friendly clothing, the e-pouch range of pouches and cases were created to be stylish and functional while using the greenest possible production methods and materials.